I found this book absolutely delightful to read. It wasn't so much as 'couldn't put it down' as I found myself at 3am still reading and think 'oh bugger, I have to be up at seven' but still wanting to read more. Cathy is born into the elite of the nether families, but is a rebellious child who actually wants to live a life where she makes the decisions, not have them all made for her. Max is an Arbiter with supernatural powers. To gain these powers he has had his soul removed. But there's more. Something is amiss. A senior personage has gone missing, someone is kidnapping mundanes and all is not well in Londinium. Have the protectors of the Split Worlds Treaty been corrupted? Londinium, Aqua Sulis and other cities are mirrored cities of the Mundanus cities in which the action takes place. That would be London, Bath to you and me mundanes. This is a multiple character book. I get the feeling that some characters introduced in this book will have a greater part in the following two? Time will tell. 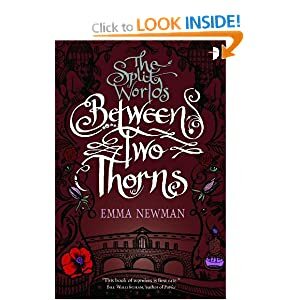 Having met Emma a couple of times, it is easy to see how she has put a good amount of herself into this book, and in many ways I quite like that. Tea anyone? Emma's world building is well thought out. I love her easy to read, effortlessly flowing prose which captivates the reader in its delightful manner. This book is the first of the trilogy, and I can't wait to see how she develops the urban fantasy worlds that she has crafted so well in the first book. Get it, read it, you will not be disappointed.